The debate will never, ever be settled as to which watch was the first to the top of Everest, or which brand Hillary was wearing. Tenzing was wearing an early Explorer, but as the two men swore never to reveal who was first to set foot on the summit, the truth died with them, whatever Rolex's marketing machine might say. 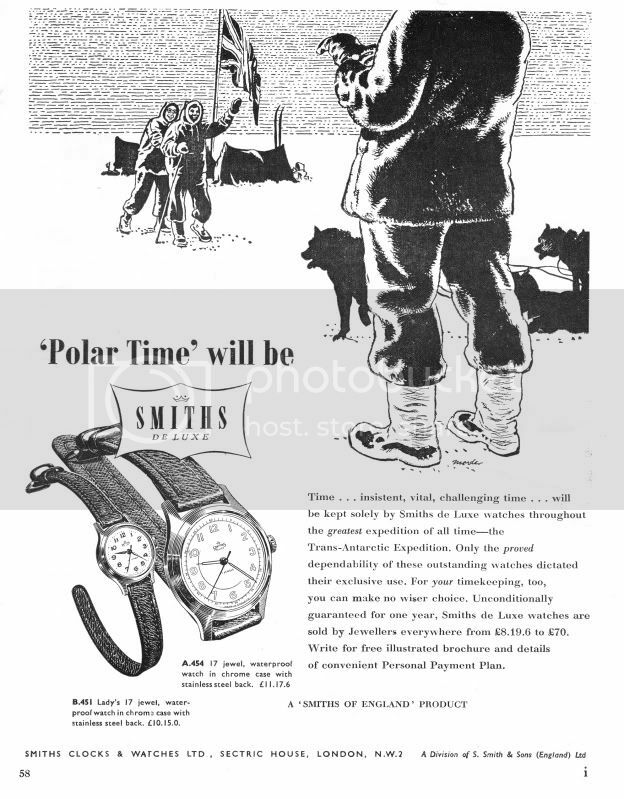 Smiths and Rolex were both suppliers to the expedition mounted by Brigadier Sir John Hunt, and Sir Edmund wrote a letter to Smiths stating 'I carried your watch to the summit. It worked perfectly'. Although it is a strange thing to use the verb 'carry' rather than 'wear'. 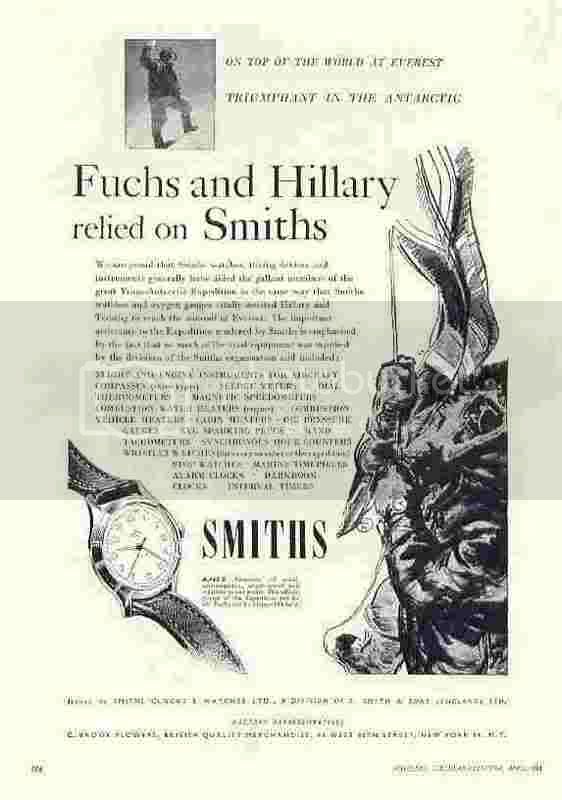 In fact, the watch that Hillary 'carried' was a 1215 DeLuxe model (12 lignes, 15 jewels), and immediately after the triumph, Smiths referred to the Deluxe line as 'the Everest model' in their advertising. 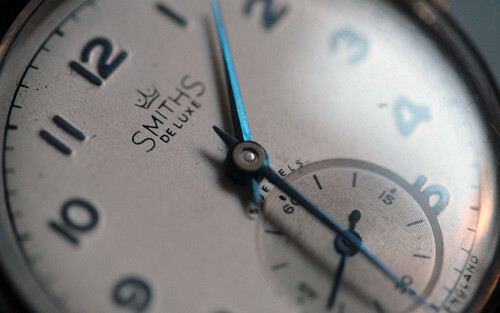 It wasn't until the early 60s that a model was sold with the word 'Everest' on the dial. Hard to believe today, but these movements and watches were built and assembled in England; Cheltenham to be precise. Here is Hillary's actual watch, which he presented to the Worshipful Company of Clockmakers and which is displayed today at their museum at the Guildhall (well worth a visit for anyone with an interest in horology). Photographs are strictly forbidden, but the attendant had popped out for a smoke, and I was briefly alone in the room. 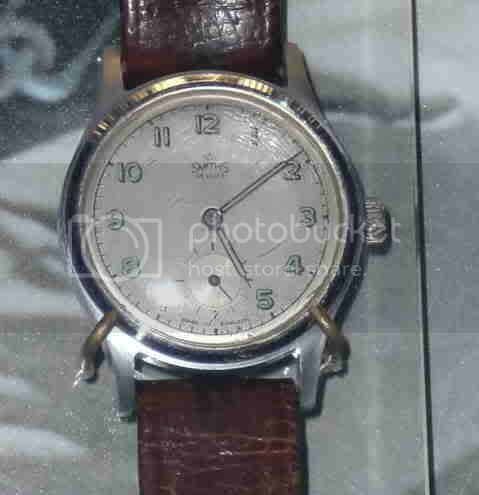 This is my birth year watch, silver cushion case made by Dennison and hallmarked for Birmingham 19 something or other. Manual wind, 15 jewel movement. A little brassy, but nothing a quick polish won't fix. Lovely blued hands with a nicely finished subdial. Simple. Rather nice, IMHO. Fantastic post, Simon - I appreciate the time it must have taken to put it together, including the period adverts. I particularly like the photo of Hillary's DeLuxe (and your BOAC prop). 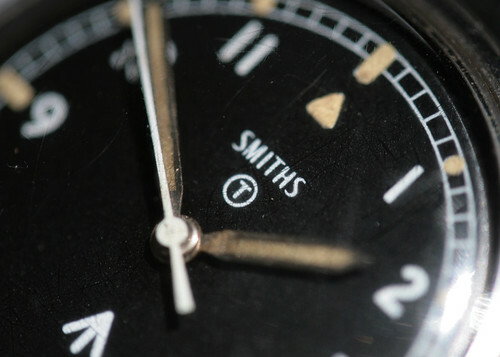 I wonder if the reappearance of the Smiths name will increase awareness and appreciation of these underrated British watches? With history like that described in your post, it will be interesting to see. 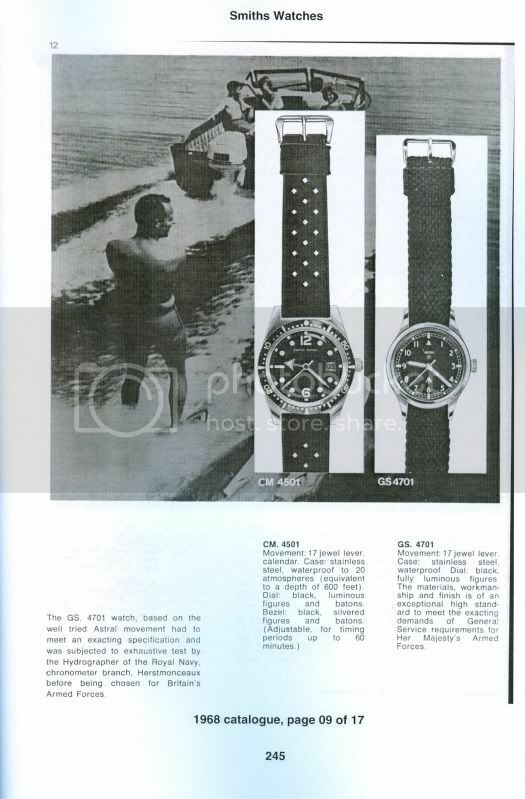 The W10 appeared in the Smiths civilian catalogue of 1968 under its Smiths' reference of GS.4701 and the legend speaks of meeting the standards of General Service requirements, which is curious as I have never seen a GS marked Smiths only W10 and 6B. Wow! Simon, that De Luxe is a real gem. Excellent post always love pics of period adverts. Also would like to add that M Smiths looks just superb! Gotta love those blue hands. 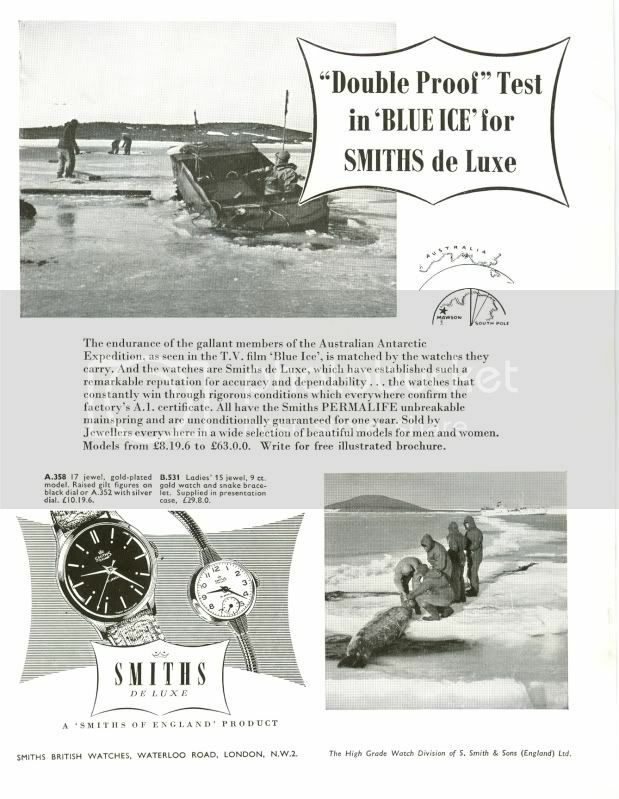 I'm doing some research on the Aussie issued Smiths De Luxe at the moment. Hope to get some confirmation as to which branch they were issued to. I've picked up some leads from Chris in Melbourne from MWR (BTW is Chris on the forum? Great bloke. Gotta have him here) He's been trying to solve this mystery for sometime now, hope we could both put it to rest. 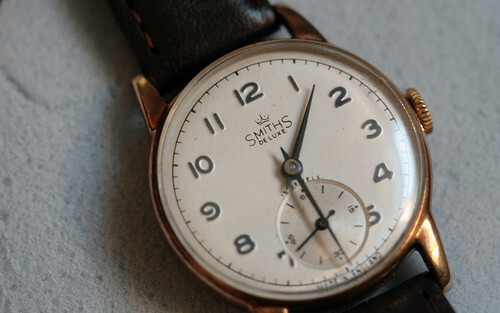 Till then, here is my 1961 De Luxe Smiths. 27 CS movement issued to the Australian military. 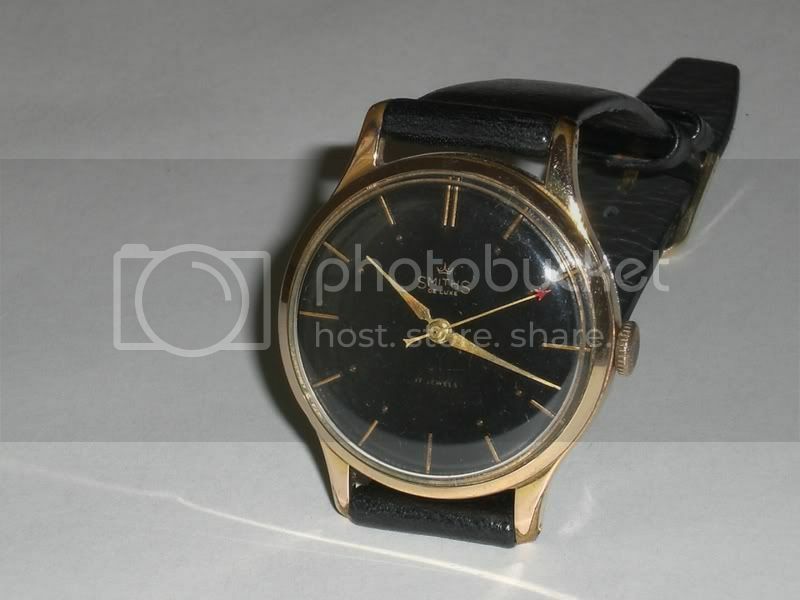 Well I'm looking forward to getting my W10 on Saturday and found this photo today while thinking about the correct strap and a black tropical NATO is currently winging it's way to me from Eddie Platts for the W10 to sit on. 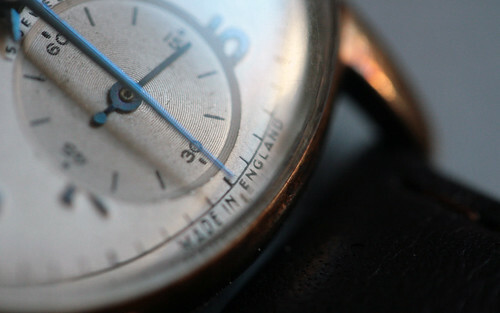 I can't wait TBH, and there are so Manu great British watch brands that deserve reviving IMHO. Very interesting De Luxe, Dan. Looking forward to some more photos and info'. Can you invite Chris in Melbourne over here please? The more the merrier! Thanks for the invitation Jon! I've just registered and am now on board. Dan, nice Aussie issue Smith's Deluxe! I only know of 7 other examples of those! BTW Dan, I appreciate the email tipping me off about the forum. I know I'll be enjoying it here. Simon, I just love your Smiths Deluxe too. The quality of their movements are excellent and very underrated in my opinion. Awesome! Great to see you here Chris! This has got to be my all time favourite mil issue watch. An Aussie issue Smiths Deluxe Thin Arrow issued in 1961 just like Dans. I'd love to hear from other owners of this model as they seem pretty scare and little is known about them. Neither RAAF or Army issue, the belief is that they may have been issued to RAN Observers of the Fleet Air Arm. I'd love to know, maybe mine flew off our old aircraft carrier HMAS Melbourne?